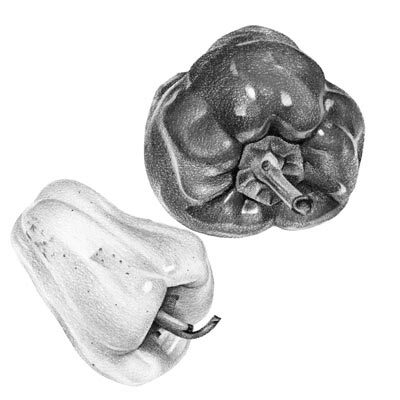 This week we will be drawing different kind of fruits. 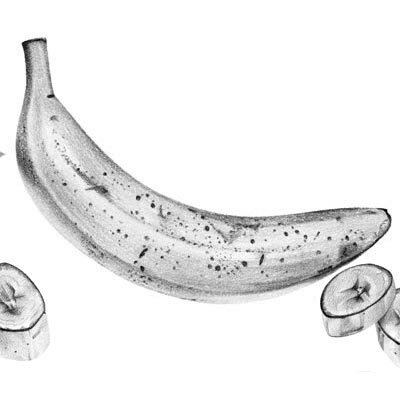 Today we begin with the amazing fruit the banana. 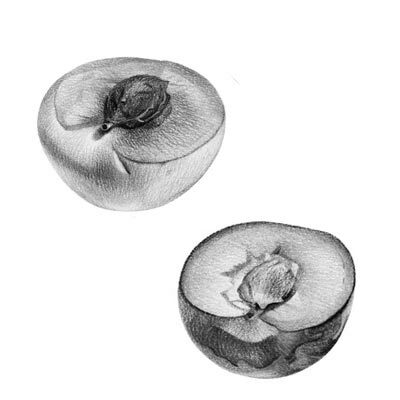 As mentioned before it is always a good idea to draw two or three fruits so that one can be cut in smaller pieces as to achieve a nicer composition for your drawing. 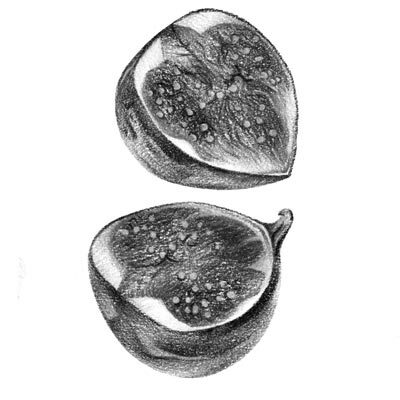 Today we are drawing the sweet fig fruit, which looks nice when cut in half or even smaller pieces. Well, not a fruit really but a vegetable instead. Must have sneaked its way into my kitchen. When you draw the outlines of a drawing first try to find the straightness and any of the curves you see and determine their angles. Don't forget to check the tonal value. 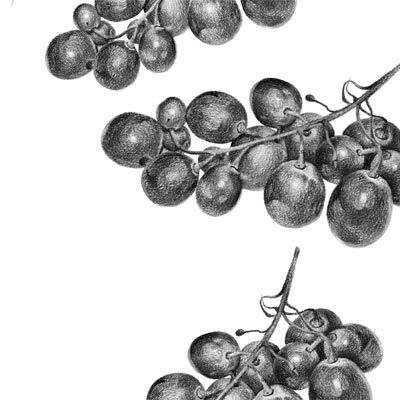 Back to fruit, today we will just draw some grapes. Peaches and plums have almost the same look, one is just darker. ​You can also see that the peach has a smoother almost velvet feel to it, whereas the plum has some sharper edges between tonal values, because its surface is more glossy. 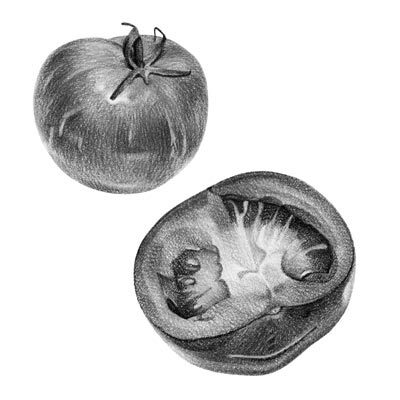 A simple tomato makes a good item for drawing. 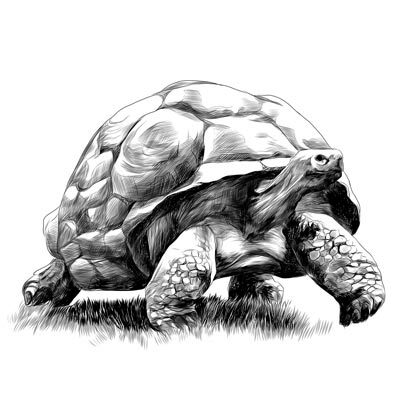 The technique used here is mostly cross-hatching. I usually take out some of the smaller highlight after having done the cross-hatching. I use a very fine erasing pencil. It is much easier to work this way round for smaller little details. 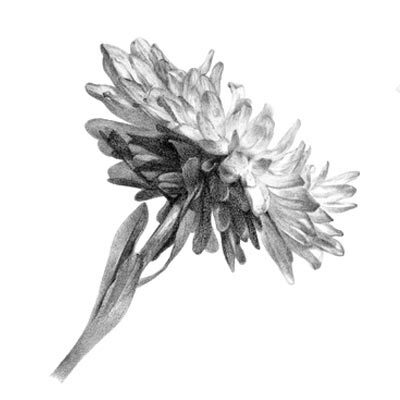 Today we are drawing a flower from the family of Asters. There are many types of this kind to choose from. Be enchanted by the beauty of flowers, which seems to bring nothing to this world but to make it more beautiful. Try to feel the excitement of drawing something onto a limited 2D surface and bring it to life that looks like something that is alive. The hydrangea is not only stunning because of its amazing blue purple colours but also in the way it is forming a large flower head with many smaller flower heads. 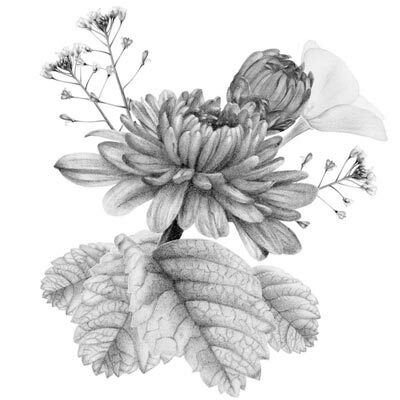 Today you can choose any flower that is does not belong into the main stream, but maybe something more rare or just simply overlooked. 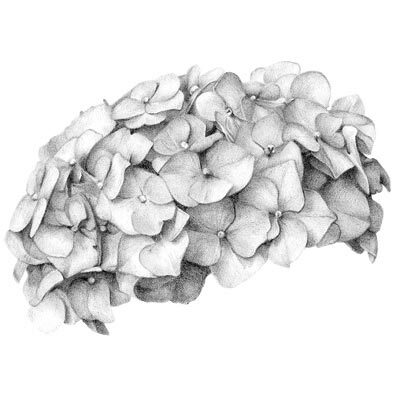 Today you can draw a leaf, be it from a beech, oak or chestnut. As with everything in nature, the variety is endless and so is the choice. 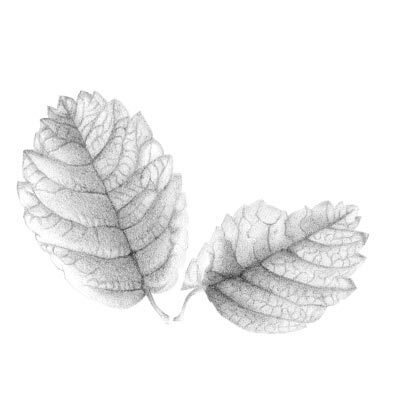 One of the most common mistakes made in drawing leaves is that students draw the veins too strong and far too dark in tonal value in comparison to the rest of the leaf. If in doubt, make veins weaker than they are. 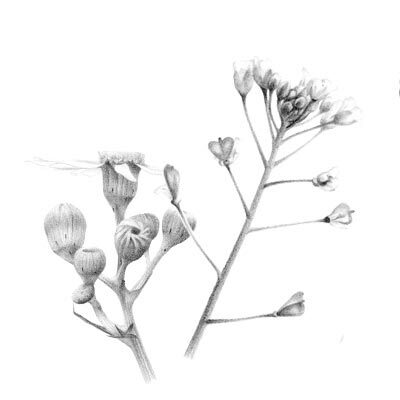 Draw any type of flower from the family of ranunculus which looks great with a bit of silver dollar eucalyptus. 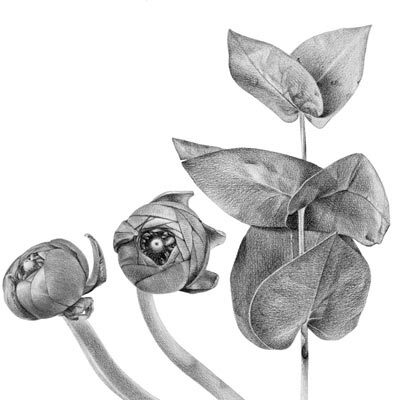 As discussed before, the nice texture on the leaves has been created with fine cross-hatching. Today try to put all the drawings you have done for this week and put them together into one drawing. Think about the composition and make little thumbnails until you are happy with the arrangement. 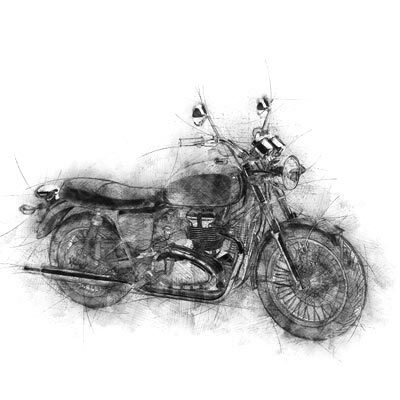 Today we are drawing a motorbike a little different. Once we have established all proportions and indicated then with line contour variations, we will add a soft layer of graphite all over the drawing, even outside of our line work. Highlights can be added later by using an eraser. Then we can add more details and darker tones. You might also see that outlines have been drawn fast and loose, which only adds to its wild appearance. 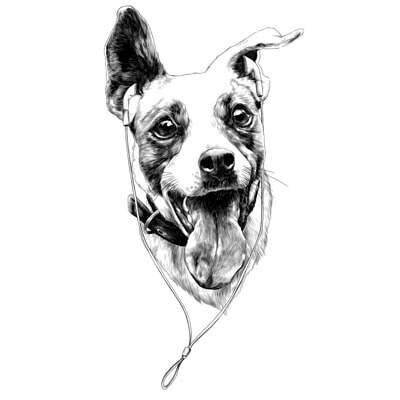 Today we are drawing a bust. Probably the most known bust is by Michelangelo depicting David. Here we have the Venus de Milo, a marble statue at the Louvre Museum in Paris, France. You will find many reference images online to choose from. 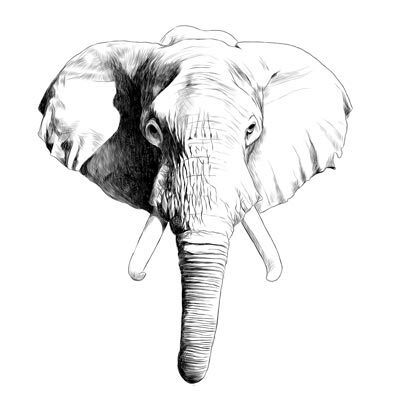 The head of elephant makes a good drawing. When drawing the lines on the trunk or across the face, make sure that the lines fade out to both sides and vary in thickness. Lines drawn that are too similar and have the same thickness will make the drawing appear stiff and amateurish. To get a soft feeling the overall drawing use the harder pencils. 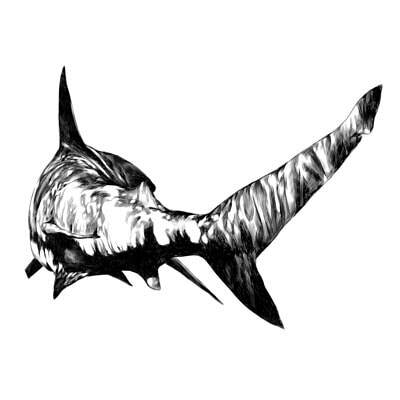 A shark appears not only dramatic front on with his sharp teeth, but also presents a haunting image when drawn from the back as seen here. Note how some areas are completely black and others are rather softer in tone. 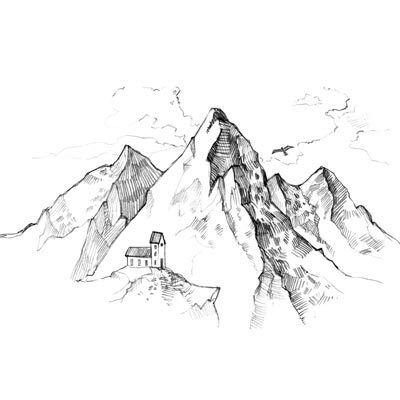 The goal is to simplify a mountain range and create a quick sketch of only the main features. Note that the tonal values in the shadow areas are altogether darker and in the light, altogether lighter. Some make the mistake that they use the same strength of darkness in the lighter areas, which creates not only a wrong impression of the subject but also makes it look far too busy. A painting needs softer and calmer areas as much as dramatic ones. 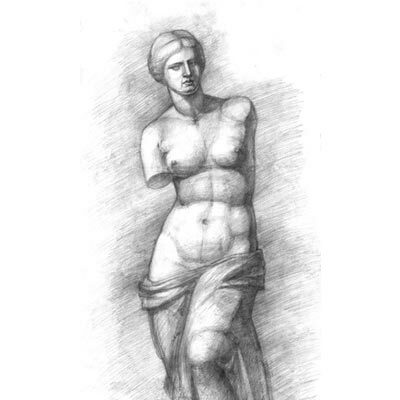 Here we see how interesting a drawing can look like if you add some interesting features. The tongue really gives the impression of movement and character. Combined with the excitement within the eyes, we come to a lively mood in this image. It is also sometimes a good idea not to finish the whole subject but to pull out only part of it. 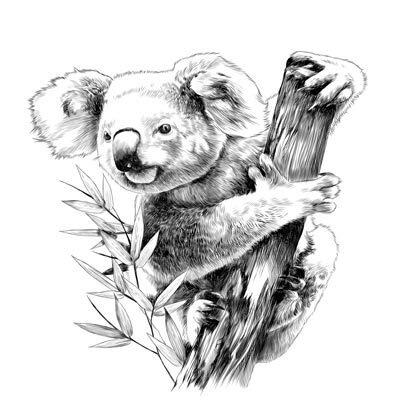 This week we will be drawing some animals and begin with animal that naturally lives only in Australia, where I live and teach. After having drawing the outlines it is best to use mostly the lighter H pencils up 6H if necessary. Some teachers frown at using softer pencils, but there is a quality to the softness that it can produce that otherwise can't be produced. Sure you can draw this also with only pencil if you are good, but you still won't get the different look of the various pencils. 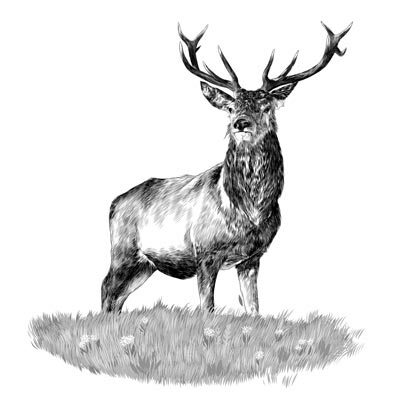 Today we are drawing a deer which is very common in Germany, the country I was born. Once more you use the softer pencils to achieve the amazing softness of the gras and fur. The Lama, locally known as Lama glama is a domesticated South American camelid, but we also have it here in Australia. Lama's are in fact quite intelligent and can learn simple tasks only after a few repetitions. They are extremely curious and mingle with people easily. 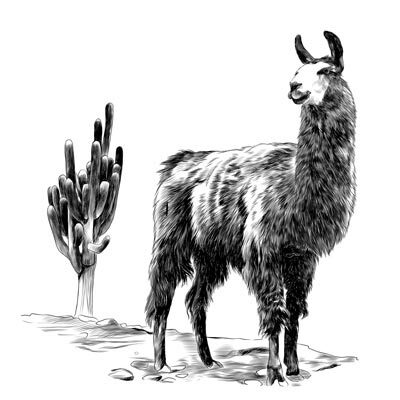 However, Llamas that are over-socialized as youth will become extremely difficult to handle when mature, when they will begin to treat humans as they handle each other, which is defined by bouts of spitting, kicking and neck wrestling. 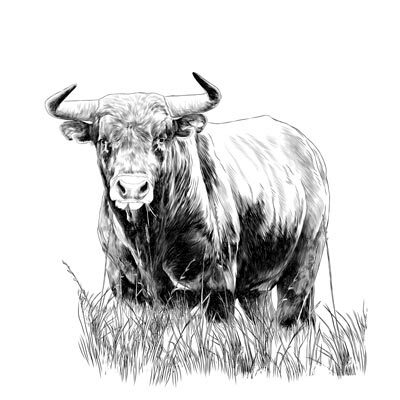 We are drawing a bull today. Maybe not Ferdinand, although I love the original story "Ferdinand the Bull 1938" by Munro Leaf as much as the illustrations by Robert Lawson. Everyone should know the story of the bull who rather smelled the flowers than fighting in a bull fight. Well, it is up to you which version you want to draw. 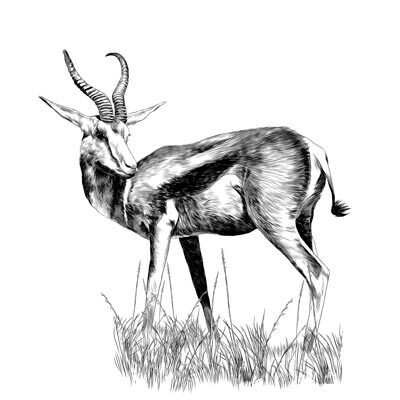 This particular type is the most common of all in Africa, the "Thompson's Gazelle" named after the explorer Joseph Thompson. It can run up to 90km/h and is the fifth fastest land animal in the world. 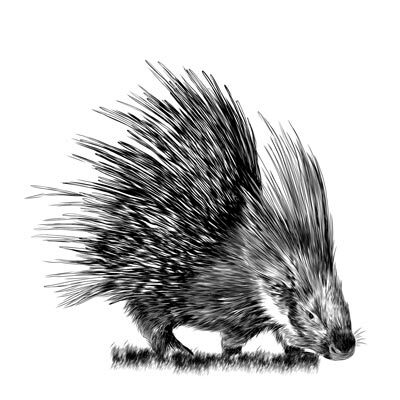 These rodents have a coat of sharp spines or quills as a protection from predators. I had the joy meeting Harriet (c.1830 - 23 June 2006), a Galapagos Tortoise who was an estimated age of 175 and lived at the Australia Zoo near the Glass House Mountains. I have never seen anything comparable, like the way she moved, ate and lived was in such slow motion that one thought time stood still. 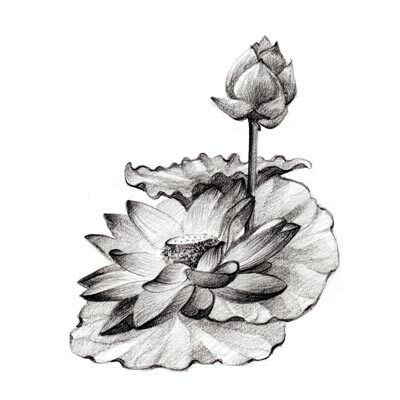 For the last day of this month we are drawing a lotus flower and leaves. Today I want you to try to use only one darker pencil that you keep sharp at all times so that it doesn't appear too rough in the darker areas.